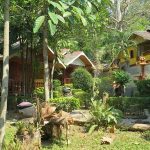 Located in the centre of the backpacker area of Koh Chang, this small resort guesthouse is available now for immediate sale. The property consists of 5 newly constructed rooms alongside a central swimming pool. All rooms are a/c with TVs and ensuite hot water shower bathrooms. The swimming pool has an adjoining bar area. At the front of the property is a 20 seater restaurant with its own bar and serving counter. Behind sits the kitchen and staff accommodation, including another a/c room. The assumable existing lease, at an annual rate in line with other properties in the area, is payable each year or 3 years in advance and can be easily renegotiated for a fixed long term, with 3 yearly increases built in. The owner is after a quick sale so open to offers. The sale includes the website and the resort guesthouse is also fully listed with several of the major booking sites. The area is very popular with backpackers and walk-in business is high.